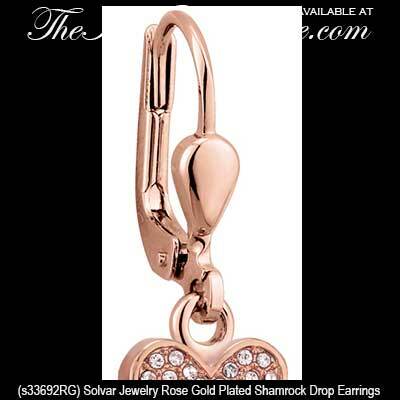 The Irish Gift House features a diverse assortment of plated shamrock earrings that includes rose gold and gold plated designs along with several silver tones. 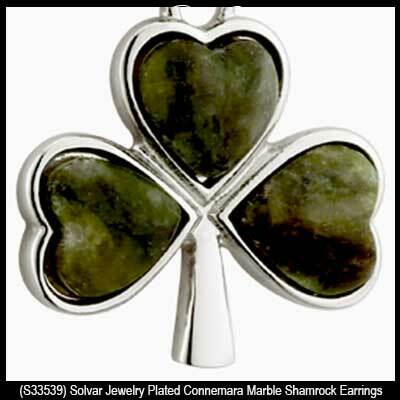 The plated shamrock earrings at The Irish Gift House are accented with various stones that include Connemara marble and crystals. We also feature green enamel and Celtic knots within this eclectic range of both drop and stud shamrock earrings. 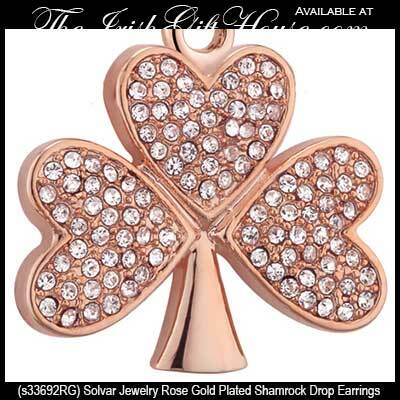 These rose gold plated shamrock earrings are a drop style that feature CZ stone studded leaves. These rhodium plated shamrock earrings are a drop style that feature CZ stone studded leaves. 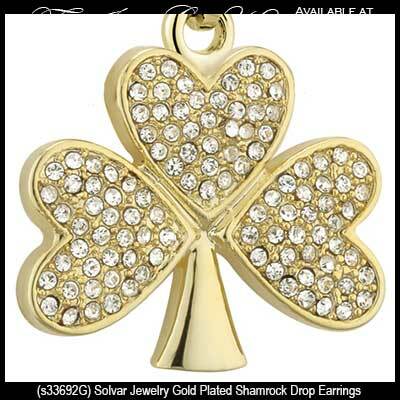 These gold plated shamrock earrings are a drop style that feature CZ stone studded leaves. These shamrock drop earrings feature a gold plated finish along with filigree Celtic knot-work. These shamrock earrings feature a gold plated finish along with green enamel accented leaves. These gold plated shamrock stud earrings feature green enamel accented leaves. These shamrock earrings are a drop style with a gold plated finish. These rhodium plated shamrock earrings are studs that feature CZ stone enhanced leaves. These Shamrock earrings are made of stainless steel. 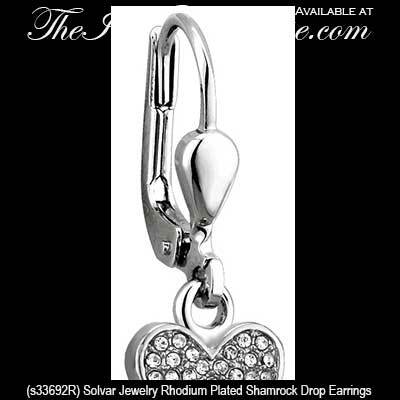 These shamrock drop earrings are a rhodium plated design. These shamrock drop earrings are a gold plated design. 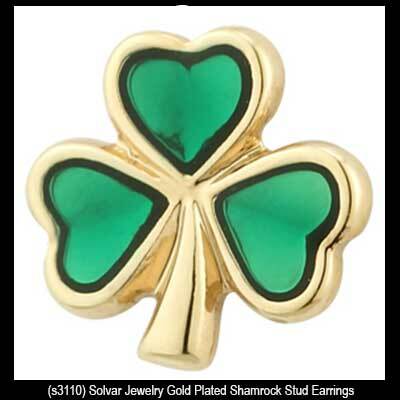 These small shamrock earrings are studs with a gold plated finish. These gold plated shamrock earrings are studs with green enamel leaves. These shamrock earrings are tiny studs with a gold plated finish. These orb shaped dangle earrings feature enameled shamrocks that are accented with crystals. These dangling shamrock earrings feature a chunky design that is finished in rhodium plating. These gold plated shamrock earrings feature a border of green and white glass stones along with an open design. These shamrock earrings are studs that feature a silver plated finish along with green enamel accented leaves. These silver plated shamrock earrings feature a border of green and white glass stones along with an open design. These rhodium plated shamrock earrings are a drop design that is enhanced with glass stones. These silver tone earrings feature a double shamrock design that is accented with enamel along with crystals. These shamrock earrings are an open design that is enhanced with enamel and glass stones. These shamrock earrings are rhodium plated drop designs that are enhanced with green glass stones. These shamrock earrings are small studs that feature a rhodium plated finish along with green enamel accented leaves. Find a complementing plated shamrock necklace to match your earring selection or add a shamrock bead to an existing bracelet. The Irish Gift House welcomes you to have some fun and go all out by creating a complete collection of Irish jewelry.